My Orange Brompton: 1000 Views of my Blog! Well almost. 1000 Views of my Blog! Well almost. Yesterday I viewed the stats for this humble blog for the first time. This was perhaps a mistake. I am getting ever closer to 1000 page views and since seeing that I was this close I have been viewing the stats more often. I must say that I am very grateful to anyone who has strayed on to this blog and read my ramblings. So, if you are reading some of my blog entries for the first time, hope that you like them. If you do, please spread the word as I have become almost obsessed in getting 1000 page views. This is very childish I know but there we go. In addition, please feel free to drop me a comment or two. I would love to hear from you. 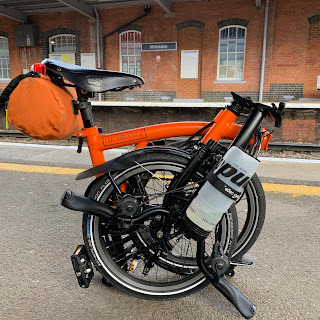 I would also be thrilled for one of you readers out their to send me off on an adventure in London - on my Brompton naturally - only to retell my experiences on this very blog. Anyway, for the moment I will watch the stats now and then and hope I exceed the magic number. Hope you can get 1000 very soon. Mine is close to that too. Keep going. Many thanks Lim. Hope that you reach this little milestone too! Getting ever closer to 1000 page views! Vampires at Kensal Green Cemetery on a Brompton! Roman Baths in London on a Brompton!